Food Trucks – What’s the appeal? Food trucks, what’s the appeal? It could happen in the middle of an over in the most intense backyard cricket game of the summer, it was enough for you to jump out of the pool and run around screaming fearful that you were going to be too late. When the faint chimes could be heard from streets away it brought a level of hysteria that must have had foreigner onlookers reaching for their gas masks in a world of confusion. It was the Mr Whippy van!!! I am not sure about you but the sound of that ice cream van was the highlight of the week in our neighbourhood. It was never scheduled and as a result, always unexpected. We even seemed to forget about it from week to week. It brought our household to scramble for every piece of shrapnel they could find for that extra twenty cents that could mean the difference between an extra flake or just the plain cone. Dont even think you were getting the choc dip though! And I think that is where we discovered the early stages of the evolution of food trucks. That’s where it started. That feeling that we could actually be getting something so amazing from the back of a van or a truck was overwhelming and made us so happy. Somewhere in our brains the neurones fused and the connection was made – I call it the Mr Whippy Effect. These days most of us have enjoyed the street food nosh that comes from the back of these cruisine mobiles. We see them parked on street corners midweek, herded into grassy fields for weekend festivals and even catering your most special events. Whether its the quality of food that comes with such small operations, the personalised service and interaction with the people who are actually cooking your food or the variety available, we love our food trucks here on the Gold Coast. 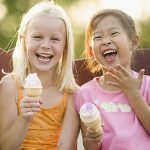 So next time you hear the bells of an ice cream truck and feel the smile creep across your face, take a moment to enjoy those childhood memories. And then run around the house looking for your wallet! Want to be a Gold Coast Food Trucker?